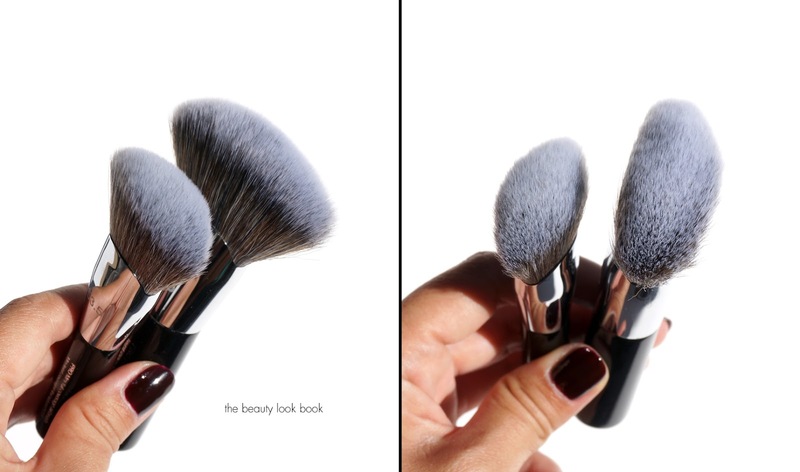 My friends and I often chat about beauty and since I’m a beauty blogger that tests quite a few things, I’m often asked “what do you think is the best _________?” Foundation brushes were the topic of discussion last month. My top three favorite tools are the Beautyblender Sponges (the pink one, the white and black ones are not as good even though they’re supposed to be the same), Tom Ford Cream Foundation Brush and the Tom Ford Foundation Brush. As soon as I said “Tom Ford” ooohs and aaahhs followed by the question, “ok, but how much do they cost?” At $72 each, neither of my friends were willing to splurge. They asked what made the brushes so good and I told them they were the only brushes I’ve tried that applies foundation streak-free and it requires no extra work to blend into the skin. Even though I had tried quite a few, I was tasked with a project to find a cheaper alternative that performed just as well. Suggested brands included Marc Jacobs Beauty, Urban Decay, Chanel and MAC. I have already tried and tested the Chanel #6 and MAC #190, both of which are good, but still give me streaks, luckily both brands have new ones out so I was able to test those. Given the fact that I am super picky about brushes that leave any kind of streaks, I was skeptical I would find anything as good as Tom Ford. I went into my local Sephora store to look at the Marc Jacobs Beauty brushes. I have had a really good experience using the Shape and Contour Brush for pressed powders, contouring powders and also foundation. It’s super dense though so it’s better suited for contouring. One of the makeup artists at Sephora recommended the Sephora Pro Full Coverage Airbrush #53 for flawless coverage. 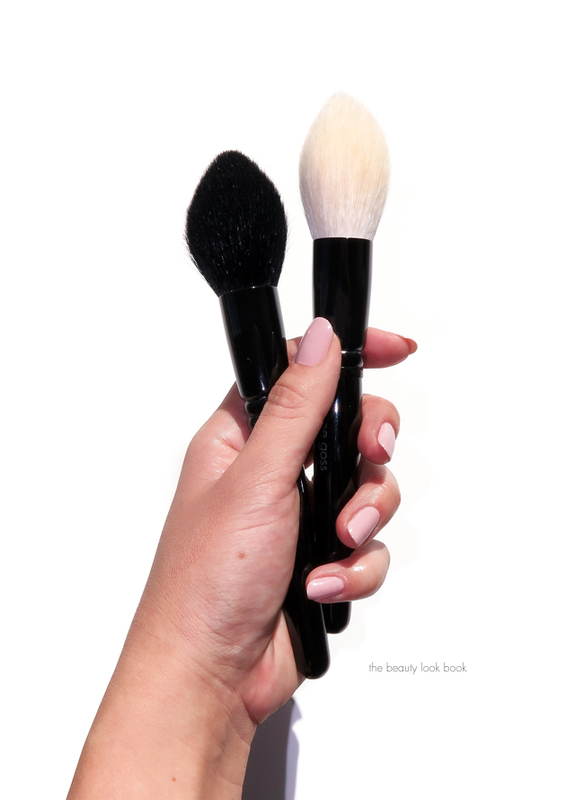 She said it’s the best brush she’s ever used – the shape allows you to get in the corners of the nose and blend easily and the wide flat shape allows for full coverage with just a few strokes. There’s also the Mini Size #53.5 and Large Size #53XL for the body/decollete. I liked the look and price of the mini, but the regular size comes with a flip open cap that comes in super handy for storage/travel. It keeps the bristles in tact without coming in contact with other tools so it won’t get kinked or smashed. In the interest of wanting to see which one was better, I bought both. The artist was right. The regular size #53 is indeed better. It’s larger and fluffier and allows for easier application with a few strokes on the face. The mini is still good but the size requires more brushing back and forth to cover the entire face. I was worried the regular size would be too large or that it would soak up a lot of product, but it actually is the perfect size and doesn’t absorb too much foundation. These are made with Naturon fibers that are made from a synthetic PBT, it feature waves and pointed tips to emulate natural fibers. I’m truly impressed with how good my foundation looked with these. These give flawless coverage that is completely streak free. 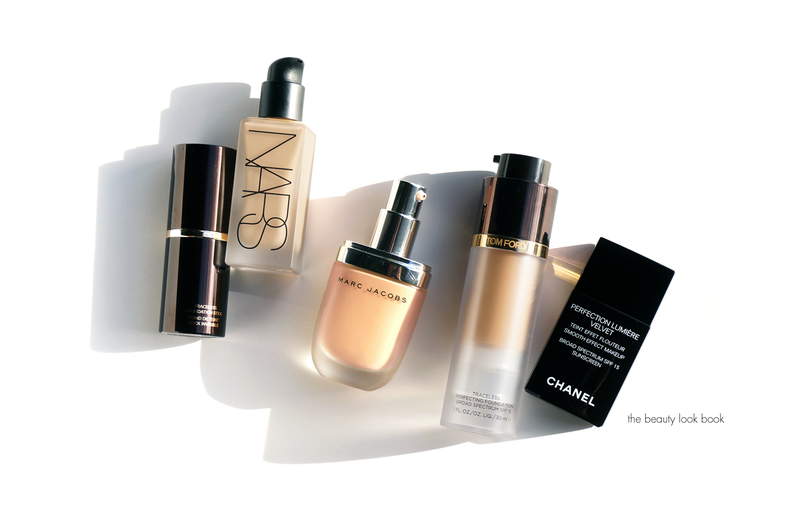 I liked these best with liquid foundation (versus stick/creams). Huge huge thumbs up. The Urban Decay Good Karma Optical Blurring Brush is something I’ve actually had sitting in my drawer for a while. It was gifted to me earlier this year. I’ve tried some other Urban Decay brushes before including the ones that come in the Naked Palettes. I’m usually not a huge fan of synthetic brushes although I’m slowly trying more and finding some really good ones these days. I put this one to the test. It has an ultra soft feel with a rounded tip. Urban Decay describes this as a vegan brush. The description of this one: “The brush’s handle is made of recycled aluminum, and its synthetic, cruelty-free brush hairs are more hygienic than real hair (but never get that stinky wet-hair smell).” I found it ultra soft and also does an amazing job at blending foundation flawlessly. For the price it’s a really good option, but I can’t call it a favorite for two reasons. The first is there was a bit of shedding before I washed it. The first washing resulted in a tiny bit more shedding but after that it was done. The second hesitation I have in giving this a glowing review is the brush head is a bit small. It’s not bad – it’s still easy to use, but after testing other brushes, I find others easier and better to get full coverage with less strokes and less blending. Still – if you’re looking for something relatively inexpensive and that will blend liquids without any streaks, this is a good option. It blends foundation sticks on the face really nicely too and is super gentle on the skin. Two of the Marc Jacobs Beauty foundation brushes have been on my wishlist for a long time, but since I was already 100% happy with the Tom Ford Brushes, I decided to pass, but in the end caved to test them. If you’re like me you probably wonder if glowing reviews are often due to hype. 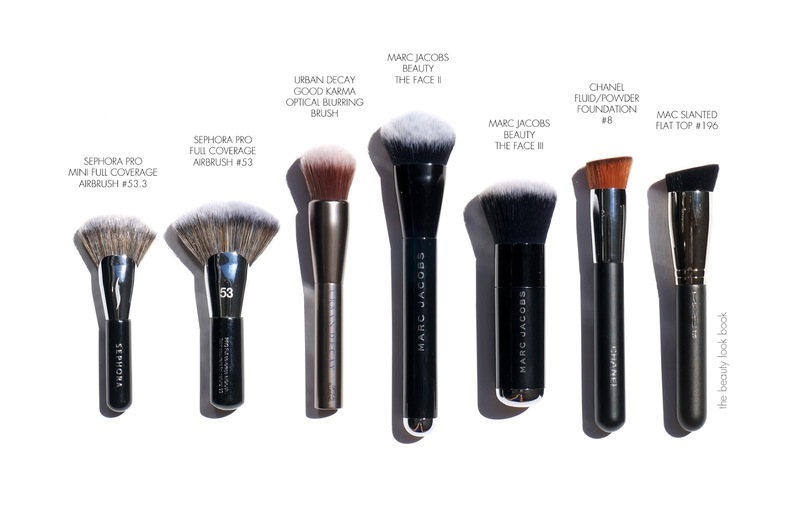 In the case of Marc Jacobs Beauty brushes – the hype is real. The newest brush The Face III Buffing Foundation Brush is on the expensive side but it’s worth every penny. It’s an ultra plush brush with a super dense head and rounded domed tip. It’s dense but still very soft so it allows for easy blending and buffing in a circular motion. It works well with sheer and full coverage foundation. The material helps the foundation meld into the skin in the most amazing way – you get flawless coverage and is 100% streak free and it applies foundation evenly on the skin. The Face II Sculpting Foundation brush isn’t a new one but it’s new for me. It has a beveled/angled tip that is perfect for sculpting the face. It’s good for all over foundation – the angled tip glides along the sides of your face, temples and cheeks smoothly. Since the tip is slightly angled, it’s skinny along the top and allows for perfect blending along the sides and corners of the nose. It’s perfect for cream bronzer. Between the two, I can’t pick a favorite – they are both really phenomenal. They both blend liquids and creams flawlessly. I tried them both with liquid and cream foundations. The Buffing Brush is better to blend out stick/solid cream foundations on the face. The Sculpting is also versatile for liquid products and blending out cream bronzers or contouring products. 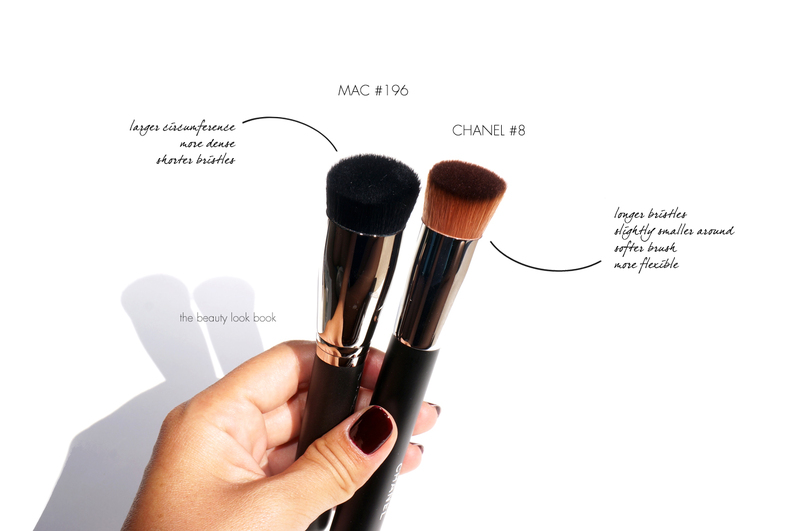 Last but not least include two of the newest slanted flat top brushes from MAC and Chanel. The MAC Slanted Flat Top Brush #196 was really hard for me to locate – it was sold out almost everywhere I looked but I did find one counter that had one left. I was told that it’s not limited-edition and will be permanent in stores but I’m not 100% sure. 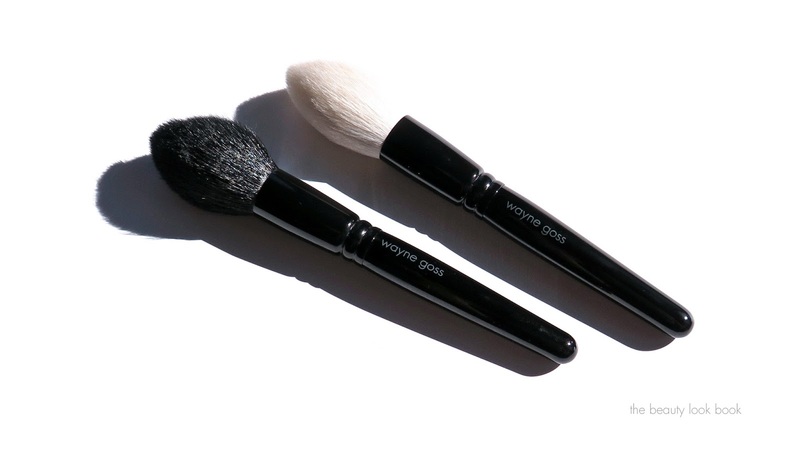 This was my ideal pick because it has a large brush head which I prefer for foundation – it allows for less blending. Unfortunately it did leave some streaks – it was easy to blend out but didn’t give a streak-free finish like the others I tested. That being said this brush was designed for the MAC Studio Waterweight Foundation which reminds me of the Armani Maestro Fusion Foundation – both of which are very fluid and thin in texture. I prefer thicker more traditional foundations that are still liquid but not super thin. Perhaps it works better on thin texture foundations. Chanel just launched a 2-in-1 Fluid and Powder Foundation Brush #8. I’ve tested this for about a week now and think it’s amazing. It’s still on the pricey side but relative to Tom Ford, it’s pretty reasonable. This one glides on the skin perfectly and gives streak-free application. It has a smaller tip compared to the other brushes which means I had to dab and blend 3x as much to cover my entire face. It does seem to soak up a tiny bit more product compared to the other tools but I’m willing to deal with it since the application is so good. I haven’t tested it with powders but for liquids I’m impressed. Side view, you can see the difference in size. I prefer the size of the MAC, but the performance of the Chanel is better. I’m really impressed with a number of these brushes I tested. I wonder what took me so long to try out the Sephora Pro Full Coverage Airbrush #53 brush (it’s better than the mini version). It’s amazing and at $38 the price is right. Marc Jacobs Beauty of course never ceases to impress me. 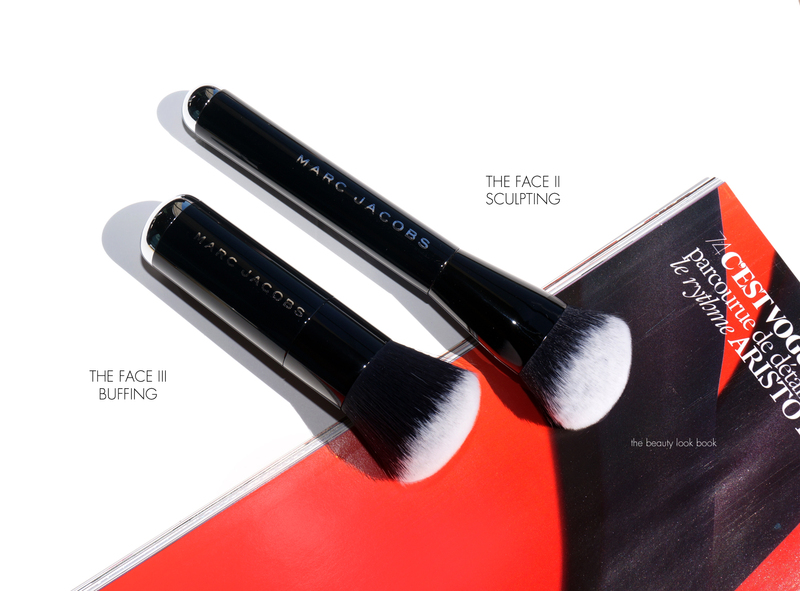 Both the Face II Sculpting and Face III Buffing Brushes are more expensive and quite a splurge – but they are really well made with sturdy handles and they have a well constructed design. I don’t think you’ll be disappointed with either and I don’t think owning both is redundant. I personally wasn’t a huge fan of the Urban Decay Good Karma Optical Blurring Brush or MAC Slanted Flat Top Brush #196. Both are good brushes for the price. The Urban Decay is a bit too small for my taste although it’s super soft and blends liquids beautifully. The MAC leaves visible streaks and although they are minimal and easy to blend out, I’d rather have something that gives me a flawless finish to save time. The short tip also makes it a bit hard to wash out – the liquids get up into the middle and it took extra work to get completely clean. The new Chanel #8 Foundation Brush gives a flawless finish and I would say it’s definitely superior to the original #6 Foundation Brush. I don’t gravitate towards small angled brushes because I think they are better suited for detail application. For foundation I want something that will apply product in larger sweeping motions. The #8 is very good though – if you’re in the market for an angled brush this is a good one to look at that won’t break the bank. 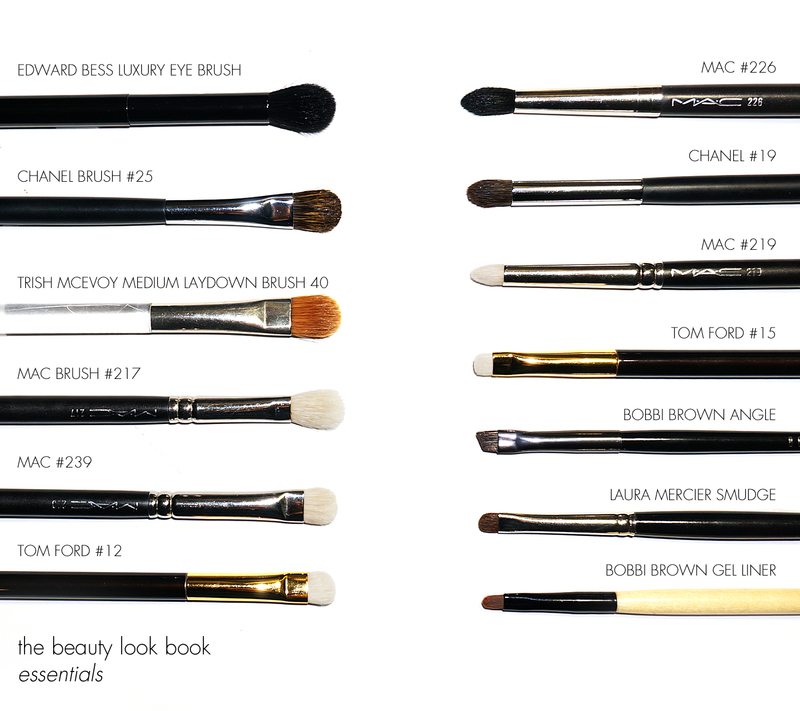 In summary, I have found brushes that perform just as well as my beloved Tom Ford brushes at a cheaper price. 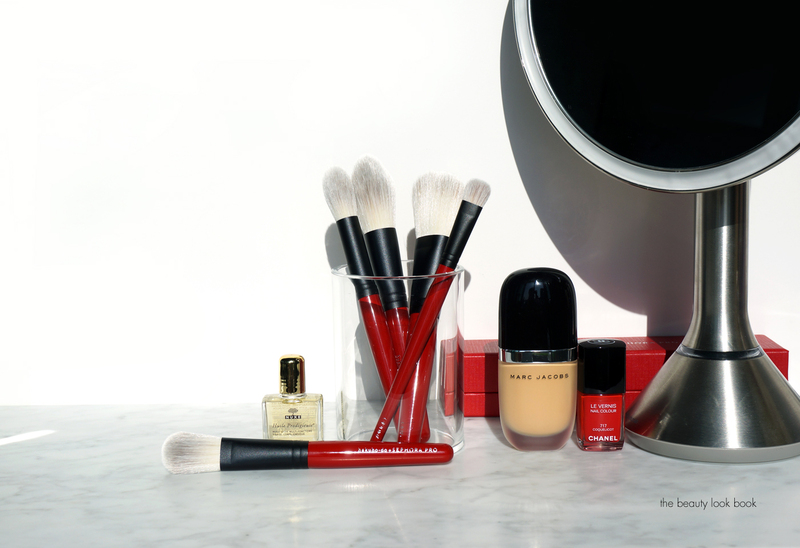 My top two picks include the Sephora Pro Full Coverage Airbrush #53 (found exclusively at Sephora) and the Marc Jacobs Face III Buffing Brush (found at Sephora and Marc Jacobs Beauty). I hope you found this roundup helpful! Do you have a favorite foundation brush? Kusabi Wedge Sloping Powder Brush $54: A large angled powder brush with a brand-new shape developed by the Sephora Pro team for the self-application of powder, bronzer, or for neck shading. 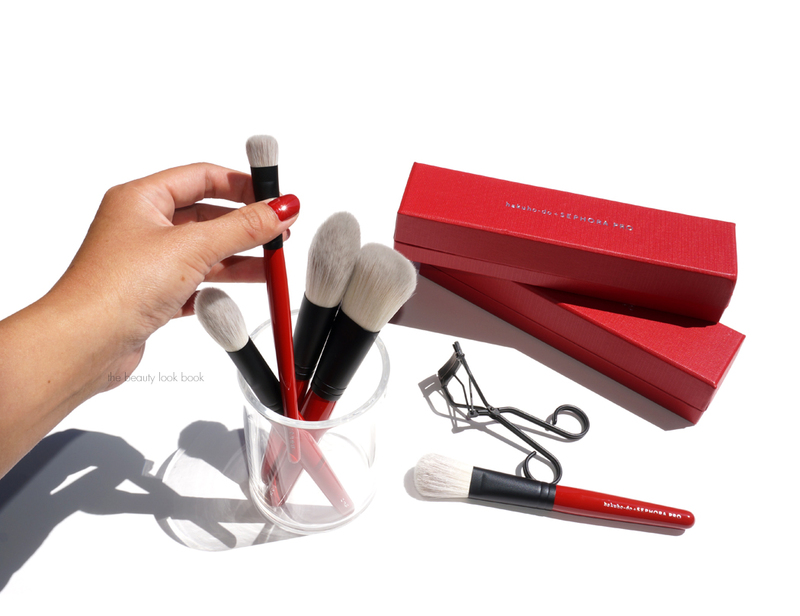 Ougi Fan Cheek Brush $40: A universal blush brush to apply blush, contour, or for a natural, no-makeup look. Otsubu Large Teardrop Pointed Powder Brush $49: A large pointed powder brush to apply powder, contour, or bronzer. Kotsubu Small Teardrop Pointed Highlighter $38: A revolutionary medium-point highlighter brush for precision contouring and highlighting. Kusuriyubi Angled Concealer Brush $30: A multitasking brush with angled shape for allover eye shadow, cream eye shadow, undereye concealer, and highlighting. I’ve been playing with these brushes for the last month. I was a bit skeptical about how they would perform with powders since the brushes are made of a synthetic blend but they perform very well. Each brush appears to have been crafted with great care. The handles are sturdy, well balanced in weight and the perfect length to fit into my hand without feeling too small or too large. The longest ones are about 7 inches in length – they are all pretty similar in terms of how long they are. In addition, the handles have a tapered shape so it allows for a better grip. The bristles are extremely soft and evenly distributed. The craftsmanship is excellent. My thoughts on each one below. Up first is my favorite of the five: the Kusuriyubi Angled Concealer Brush. It’s designed for concealer but I think it is a multi-tasking brush. It’s quite dense and the perfect width. Most concealer brushes are either too wide/flat or too small/skinny. This one is perfect for blending concealer under the eye. It also works well with both powder and cream shadows. It’s extremely soft even though it’s dense – the shape is perfect and there is no poking whatsoever. I’ve shown it below to an Edward Bess and Cle de Peau Beaute concealer for size reference (thoughts + swatches here in case you are interested). I do think it’s worth buying a second one to keep separate for eye products. It’s dense enough to use as a detail highlighter for the eyes as well. Next up are the Ougi Fan Cheek Brush and Kusabi Wedge Sloping Brush. The Ougi Fan Cheek Brush is the smaller one shown on the left. I placed it next to a Tom Ford Blush for size reference. This one is supposed to be a multi-tasking brush for powder, contour or bronzer. I thought the name “fan” to be odd because it’s not fan-shaped at all – however it does fan out a little when you press it to your face. This was the one I was least excited about simply because it looks so slim – but it really surprised me. I tried it with several super pigmented blushes and it picked up just the right amount of color to give a smooth even application. Since it’s a synthetic material and slim I thought I’d try it with foundation too – it works surprisingly well to blend liquids into a flawless finish on the skin. The Kusabi Wedge Sloping Brush is a powder brush. It has an angled tip that has a very slight slope. This one is designed for powder, bronzer or neck shading. I didn’t like this for all over face powders (pressed or loose). I found it didn’t pick up enough powder for my entire face – the shape and angle made application feel odd. For bronzer on the other hand it’s amazing. The sloped shape makes it glide along the side of the face easily. For bronzers it picks up just the right amount of product to apply to the cheeks. It blends powders beautifully. Given the fact that I usually use powder brushes for bronzer though I don’t think this one is a must. The last two brushes are the tapered teardrop ones. They are both extremely soft and plush. The Large Teardrop Pointed Powder Brush isn’t as dense as the others in the collection. It is a super soft almost fluffy-feeling brush. Since it’s not quite as dense it will give the face more of a sheer wash of color if you use bronzer or highlighter. I would recommend this one over the Wedge Sloping Brush if you wanted to narrow down your picks. It has a similar function but performs better. The Small Teardrop Pointed Highlighter Brush is similar in shape but smaller and more dense. It has a similar shape and size compared to the Charlotte Tilbury Powder & Sculpt Brush. The Sephora Pro brush does the job in terms of picking up highlighter for the cheek bone area or cheek sculpting but I find the Charlotte Tilbury far superior. It picks up powder product better while the synthetic material of the Sephora Pro brush works, it’s just not as good in my experience. Overall these exceeded my expectations, especially considering they are synthetic brushes and I don’t usually like synthetic material for powders. They performed really well with face and cheek powder products and I’m really impressed with the quality and craftsmanship. Each brush is well designed and although they are on the pricey side they are very well made. I’ve accumulated a number of brushes over the years – it’s only recently that I started using Japanese brushes because they are usually so expensive. The ones I’ve tested that are made in Japan are far superior to any other brushes I’ve tried. These are no exception. Still the synthetic material for powders is new to me. I would say the Concealer Brush and Large Teardrop Brushes are the two I would recommend the most. I’ve already ordered a second of the concealer brush. The Fan Cheek brush surprised me – it performs really well for powder blush and foundation, but since I already own a number of blush and foundation brushes I can’t call it a must-have. I do like it a lot though. For the other two I would say skip – however they are extremely well made and soft. 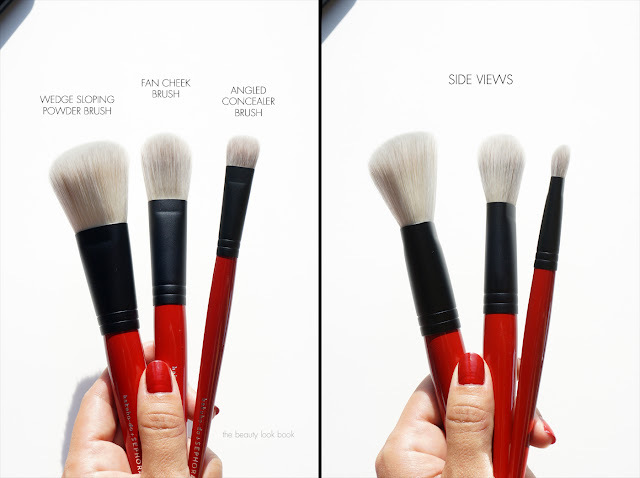 Have you checked out these brushes yet? If not do you have any favorite synthetic brushes in your collection? 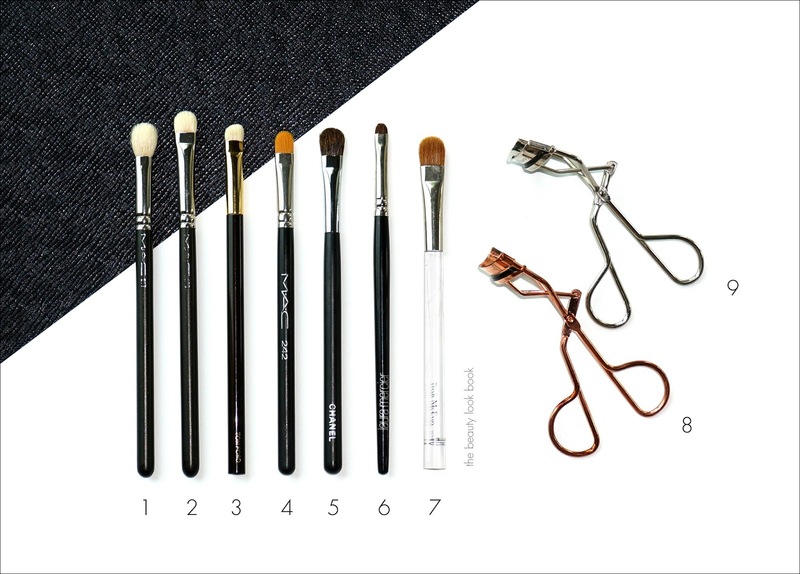 If you’re curious on how to use these, Sephora has short videos on how to use each brush online. 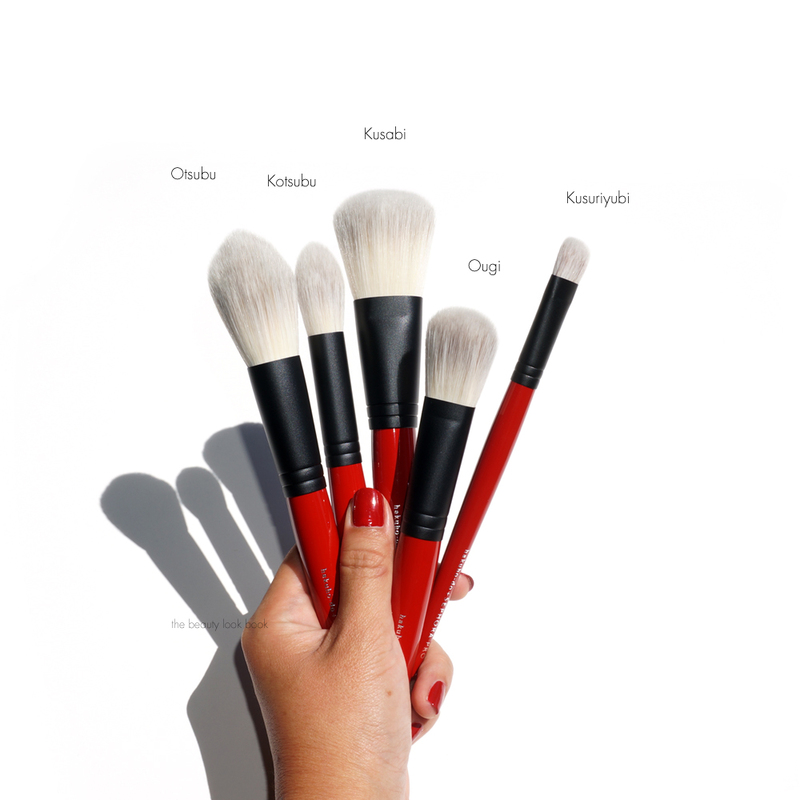 The hakuho-do + SEPHORA PRO Brush Collection currently consists of five brushes, each available for purchase individually. They are exclusive to Sephora and prices range from $30 to $54. 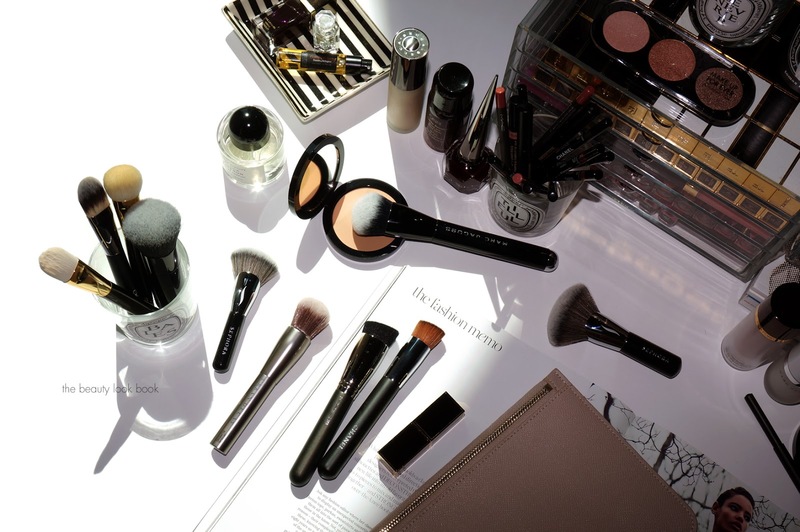 The hakuho-do + SEPHORA PRO Brush Collection brushes were provided courtesy of Sephora for review consideration. All opinions my own. I’ve compiled several detailed brush guides this year but several of my readers have asked for a more consolidated list of recommendations. Like most of my beauty routine, when it comes to makeup tools, I rarely stick to just one brand. I think different lines have certain strengths in particular areas. Some have a better shape while others are made of better materials. There is a lot to sort through in terms of brush shape, size, material and price point. For me, it’s really important that I am able to test a brush in person before purchasing it so I tend to stick to main stream brands. Today I’ve compiled a list of my most reached-for tools for face, cheeks and eyes. 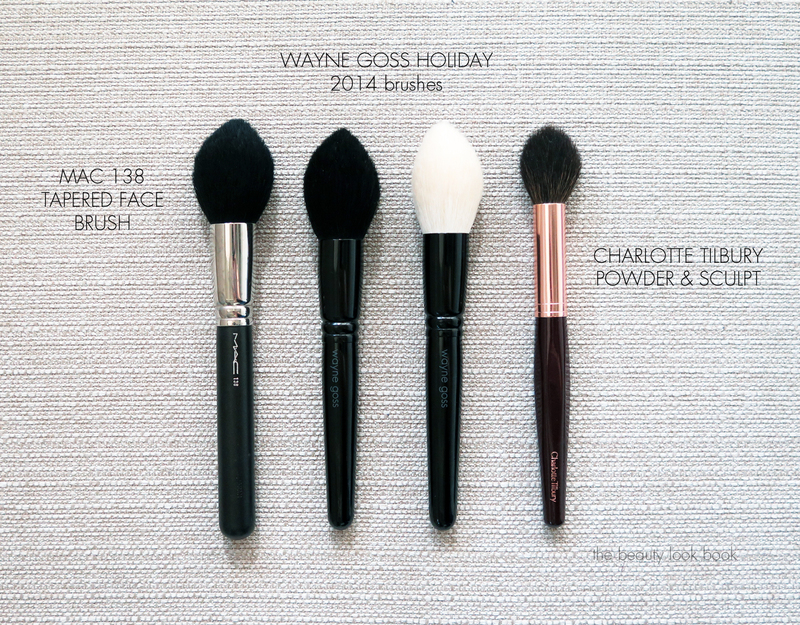 My top picks for brush brands include MAC, Chanel and Tom Ford. In my experience, the overall best brand for quality and price is MAC. I own many MAC brushes that have lasted me over a decade. I like that the brushes have a simple and sleek design and the quality is consistent among all the tools regardless of material or type. Chanel is also another great brand that I use a lot for brushes and tools. They recently redesigned all their brushes (I think in the last year or so) for a more modern look. The tools work really well with all brands of makeup. There are many similarities in shapes between MAC and Chanel although the material is very different in most of the tools. If price is no object, Tom Ford hands down makes the best brushes I’ve ever tested. All the brushes are super soft and plush and perform the best out of all the tools I’ve tried. The cream foundation brush is the only brush that gives me a streak-free application for foundation or tinted moisturizer. Tom Ford’s brushes are among the few brands I ordered sight unseen. I splurged on a brush set a few years ago and although it made a serious dent in my wallet but I have no regrets and it makes applying makeup a truly luxurious experience each day. 1 / Beautyblender ($19.95) is the best sponge I’ve used. I just discovered it this year and don’t know how I ever got along without it. There are multiple colors and types of beautyblenders but the pink one performs the best. Use it damp and it expands and applies foundation flawlessly. 2 / MAC Duo Fibre Face Brush #187 ($42) everyone needs a good skunk brush. These are fluffy brushes with two types of material mixed in. The uses for this are endless. I like to use mine to apply powder bronzer or highlighters to the face. You can also use these with cream products or to buff out powder foundation or to blend items. 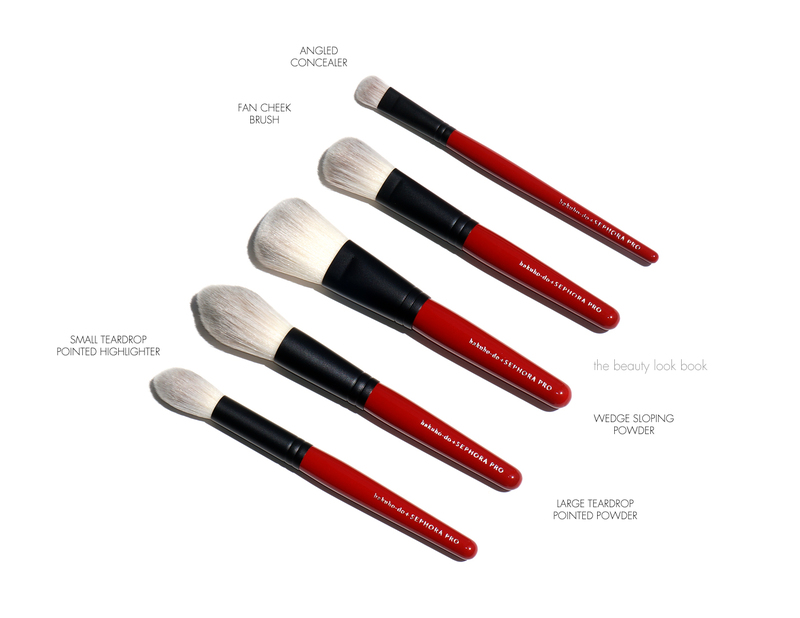 MAC also makes the Duo Fiber brushes in a number of other formats like the Short Handled #187 and a tapered Blush #159 version. I like the classic version the best. 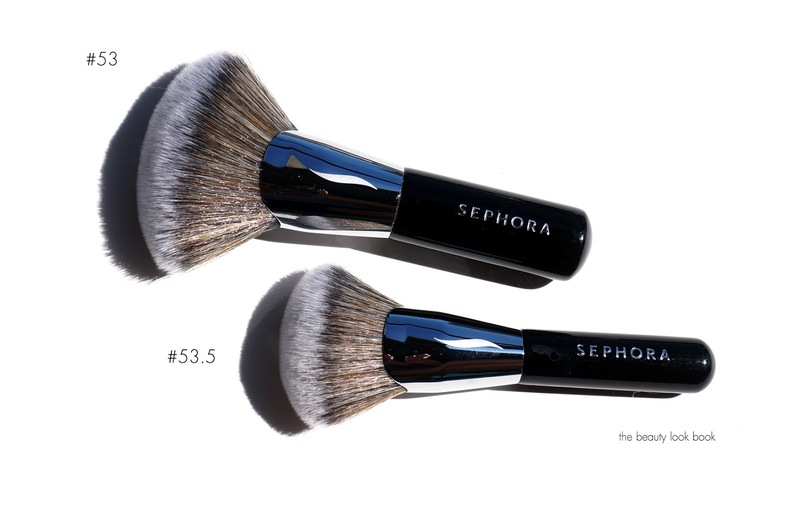 3 / MAC Large Angled Contour #168 ($35) is super soft and fluffy angled contour brush. I use this for bronzer or blush (primarily powders). It’s also a good blending tool. The angled edge helps control application. 4 / Tom Ford Cream Foundation Brush #02 ($72) is the best foundation brush I’ve used. It’s one of the most expensive tools I own but worth every penny. When I use this to apply liquid or cream foundations, application is flawless and completely streak free. I normally prefer to use sponges for foundation but often times they soak up so much product. This is the closest thing I have to getting a sponge-finish look with foundation but in brush format. 5 / Chanel Foundation Brush #6 ($45) is my most reached-for foundation brush. It’s not quite as perfect as the Tom Ford, but for me it’s the next best thing. I like this for cream blushes too. 6 / Chanel Blush Brush #4 ($54) is my favorite blush brush because of the shape and material. It’s medium-sized and compact but has just the right amount of density to pick up color and dispense it perfectly on the cheeks. MAC makes a lot of good blush brushes too which are very good quality, but I find myself reaching for the Chanel the most. 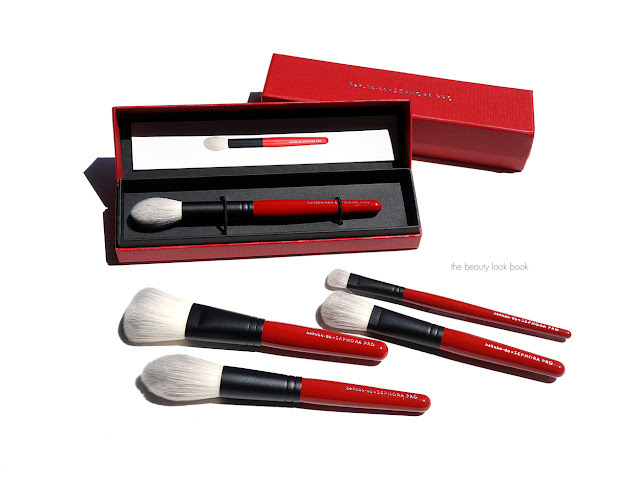 7 / Chanel Powder Brush #1 ($65) is my favorite dense but soft powder brush. I use this for loose powder, pressed powder and powder foundation. It comes out of the box tapered but once you wash it it fluffs up quite a bit while still retaining a round shape. I like that it’s sturdy with a substantial handle but still easy to hold and maneuver. 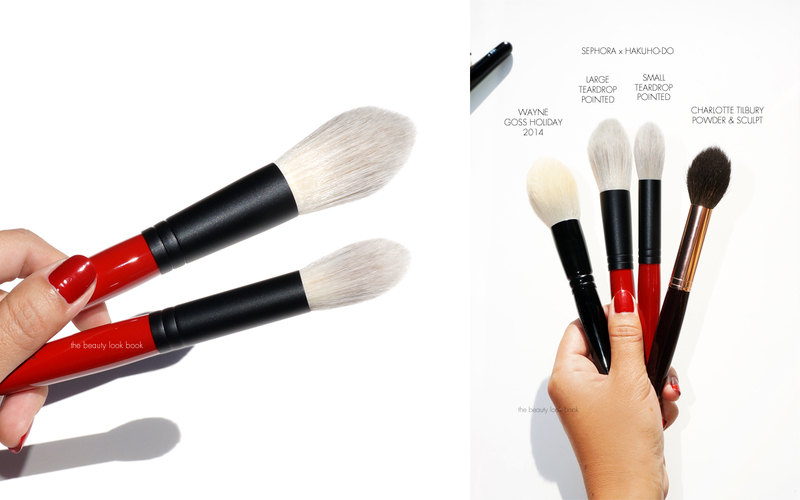 1 / MAC Blending Brush #217 ($24) is the best white fluffy brush you can find for $24. This is key for me in terms of blending shadows for a subtle gradient. I also like to use this as a regular eyeshadow brush when I want an all over lid color. 2 / MAC Eye Shading Brush #239 ($25) is in my top 2 picks along with MAC Brush #217. This is my all time favorite eyeshadow brush. It picks up color really well and blends powders together nicely. I like that it’s dense but super soft. 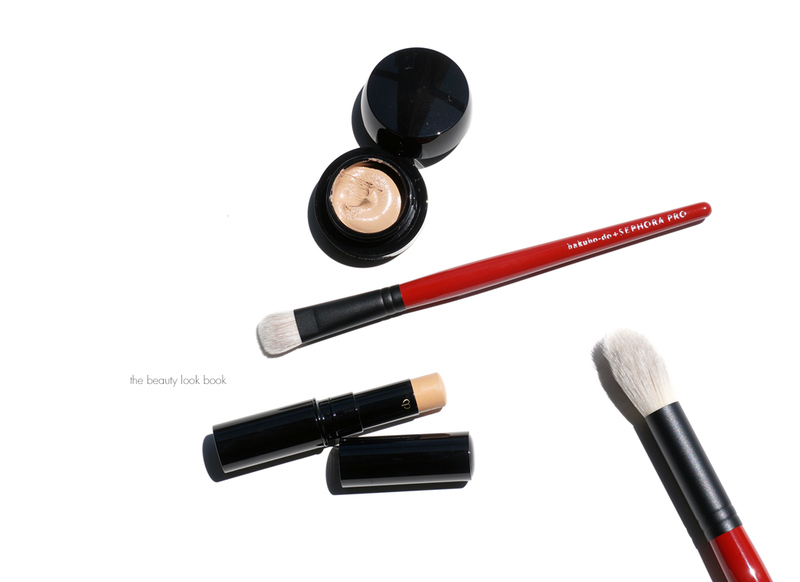 3 / Tom Ford Eyeshadow Contour Brush #12 ($56) is another favorite. This is my do-it-all kind of brush. It applies shadow on the lids, it will contour or smoke out darker colors and the tip is dense for a smokey eye. 4 / MAC Shader Brush #242 ($25) is what I like for cream shadows (or concealer too). This one has lasted me the longest, I think it was one of the first MAC brushes I bought for myself. It has a really nice round tip making application easy and smooth on the eye (so it doesn’t poke the skin). 5 / Chanel Large Eyeshadow Brush #25 ($38) is a medium to large eyeshadow brush that isn’t too big or fluffy. I do like a good fluffy brush, but these days I find myself reaching for this one because it isn’t as thick or dense making it easier for me to control color and application. If you want something fluffy, soft and more dense, the Bobbi Brown Eye Sweep Brush is one of my favorites. 6 / Laura Mercier Smudge Brush ($24) is a good dense detail brush. It’s stiff but not too stiff so it’s easy on sensitive skin or eyes. I like this one to smudge eyeshadow or eyeliner. I use this instead of a regular liner brush because I like a more smudged softer line to define the eyes. It offers precise application but if you are looking for something super precise, I’d recommend the Bobbi Brown Eye Liner Brush or the Angled Eye Definer Brush. 7 / Trish McEvoy Laydown #40 ($42) is one of my favorite multi-purpose brushes. I like this for powder eyeshadow, cream eyeshadow and concealer. I owned this back when Trish McEvoy had gold handles for the brushes (they are now lucite). It’s the perfect shape, size and density for creams to get a good smooth and even application. 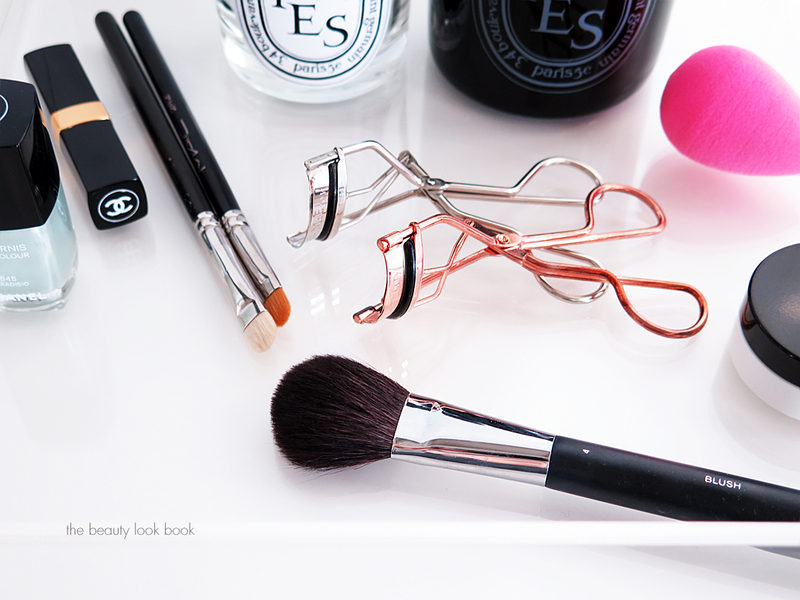 8 / Charlotte Tilbury Eyelash Curler ($20) is one of the newest eyelash curlers I’ve tried. When I first tried it I wasn’t super impressed because it’s called the “Life Changing Lashes” eyelash curler and well, it simply didn’t change my life. I found it just as good as my Trish McEvoy and Chanel eyelash curlers but not anything super special. I’ve since tried a few others from other brands like Shiseido and Shu Uemura and have really come to appreciate the design and shape of the Charlotte Tilbury. It has just the right amount of curve to fit my eye shape. Many others are too flat or not curved enough. The wrong shape will either pinch my eyes around the corners or miss lashes making the curl uneven. I give the Charlotte Tilbury a huge thumbs up for the way it performs. 9 / Trish McEvoy Eyelash Curler ($20) is a classic go-to for me. I have several of these right now and it’s been my most-replaced tool (some recommend you change or the pads these every 90 days, I tend to use these longer replacing once every 6 months). It just works the way an eyelash curler is supposed to. It grabs all the lashes and curls them evenly and in a round flared up shape. I have some additional thoughts on brushes focusing on double duty or recycling. Based on the above guides, you might be wondering what I recommend for eyeliner, concealer, crease, bronzer, brows or lips. I think a lot of tools can be used multiple ways which means you can stretch out the uses. Having multiple brushes can be extremely useful so you don’t have to worry about mixing colors or washing brushes frequently if you change from a light to a dark color for a certain tool. I do like brushes that will do multiple things though. For bronzer, I will sometimes use my blush or powder brushes. For the eye crease or contour I find the MAC #217 works just perfectly. For concealer I like blending with the fingers or a sponge. For brow a lot of brow pencils come with a brush on the end to smooth out the color. I’ve bought a few brow combs before but find they don’t last me very long so I like to recycle my mascara wands after they are used up. Rinse the end with soap and warm water and you’ve got a lash comb and brow comb in one that you can toss whenever without worrying about throwing money away. Lip pencils often come with a lip brush at one end so I don’t find the need to purchase a separate lip brush for gloss or lipstick. Chanel and Dolce & Gabbana have lip brushes which I find handy. Last but not least, long time readers know I’m a fan of recycling candle jars. 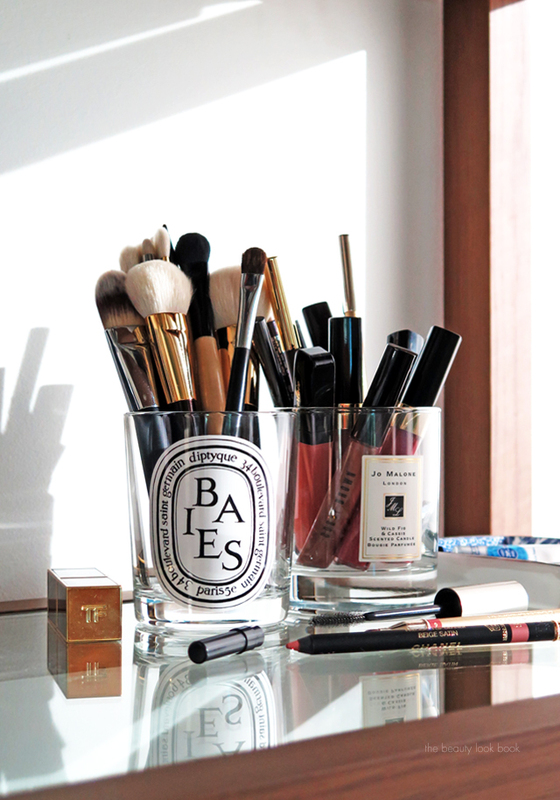 I use them to store brushes, pencils, lip gloss and office supplies. Diptyque and Jo Malone are my favorite to recycle. I just clean them out with warm-to-hot soapy water and a dish sponge. My candles don’t always have a clean burn so often times there are remnants of wax stuck on the sides. Some recommend freezing or using boiling water. I find that using anything too drastic with temperature changes can crack the glass or melt off the sticker (which I like to keep in tact). Building a good brush collection will take some time but it doesn’t have to be complicated. 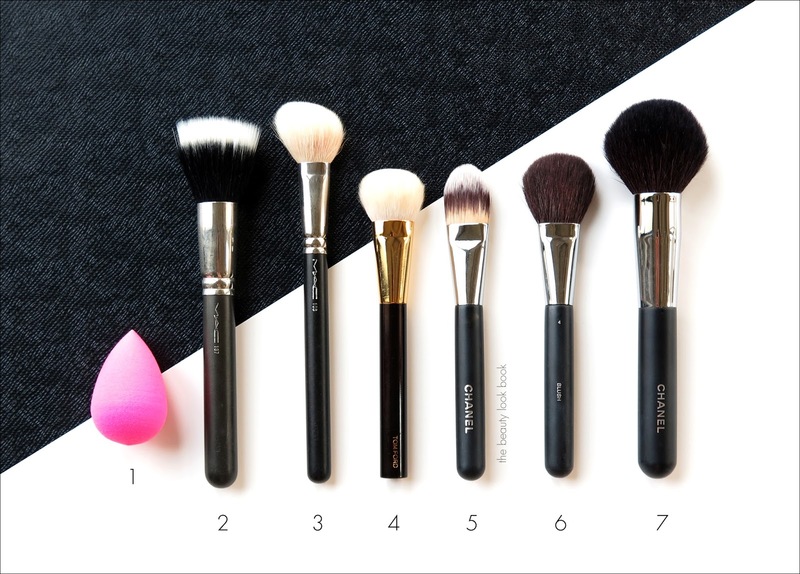 Brushes can be pricey especially when you add them up so I do recommend taking your time to research in advance to make sure you find ones that work best for your specific needs or wants. I hope you found this guide on my favorites helpful to start! This post was sponsored by Nordstrom. All opinions my own. All tools my own. For more information you can refer to my Disclosures. To apply makeup, I’ve been using either a full length wall mirror from Ikea (similar here) or for close ups an older style Restoration Hardware countertop mirror (similar style here) that measures about 7 inches in diameter, both of which aren’t ideal due to lighting situations where our larger mirror is stored in our house and also because of the small size of the counter top mirror. I’ve been searching for quite some time for a good countertop mirror that is slightly larger than what I have that is sturdy and well designed with a silver steel or satin nickel finish. Having a simple classic look for household items is a must for me so finding the right mirror with the right design, size and overall look has been a challenge for me. 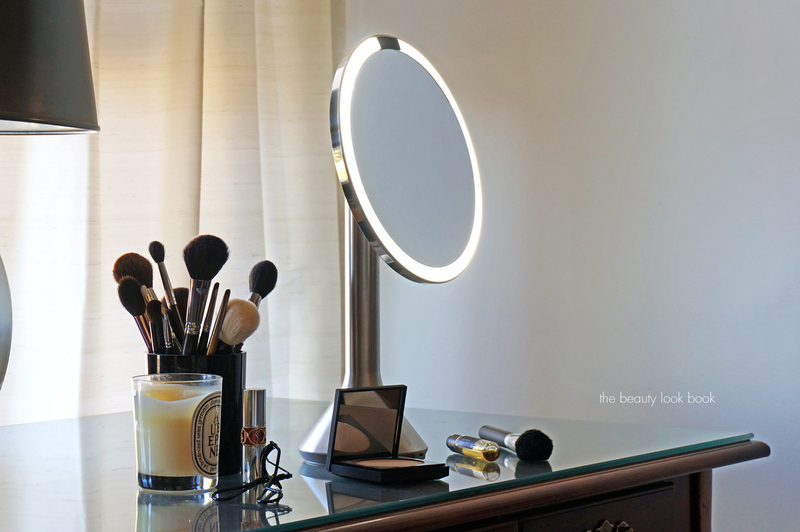 When I received press information about the simplehuman Sensor Mirror options, the e-mail couldn’t have come at a better time, especially since I am a huge fan of simplehuman products for their simple, sleek and modern product designs. My favorites are their sensor soap dispenser and dish racks. simplehuman has several sensor mirror options. 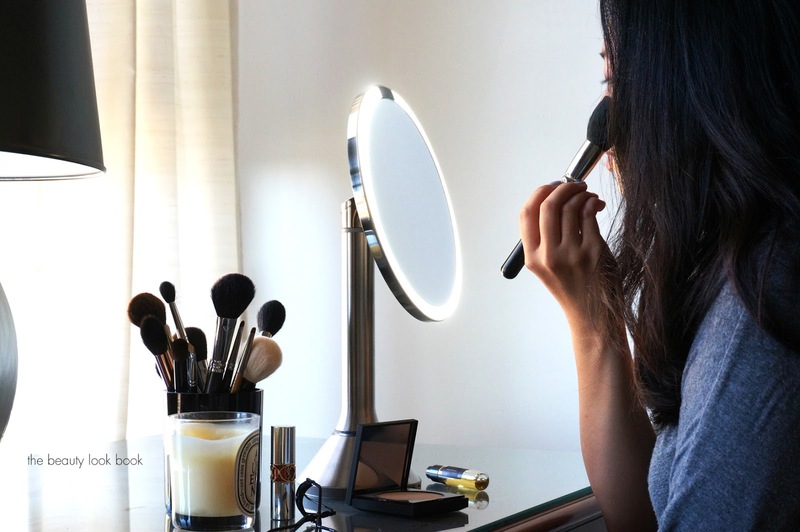 The one I received for review is the regular Sensor Mirror ($200, 9.1 inches wide and 15.1 – 18.1 inches tall, approximately 3 lbs) – it’s the larger size option with an adjustable stand which allows you to extend the height. The mirror is adjustable as well so you can bevel it at different angles. These come with an automatic sensor at the top so the lights turn on when your face nears the mirror and stays on as long as your face is relatively close (within the sensor’s range). The tru-lux light system provides 600 lux and a color rendering index (CRI) of 90—more than twice as bright as the next best and more similar to natural sunlight. 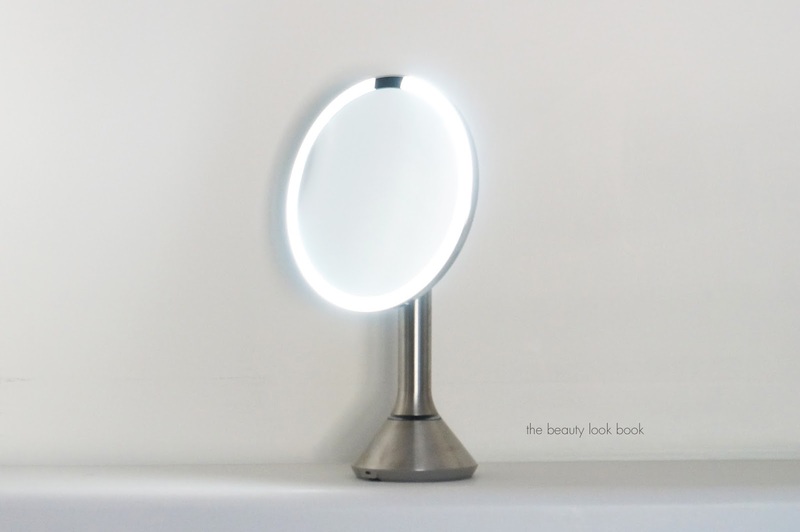 The mirror features high-performance LEDs that are rated to perform like new after 40,000 hours—that’s an hour a day, every day, for more than 100 years so you never have to change a bulb. The light recharges using a standard USB port or wall outlet. (One charge lasts up to five weeks.) No alkaline batteries are required. There are no cords to clutter up your countertop and the mirror is easy to use anywhere. The mirror is extremely well designed and also well made. The lighting is impressive and mimics natural sunlight without being blinding. My first impression upon testing this out was, “wow.” The magnifying power is simply incredible. I showed this to several friends and family and they were all incredibly impressed (male and female). Nobody I know gets excited about mirrors so I was really surprised by the reaction people had to this product. Reviews indicate that most everyone who has purchased this really loves this even though it’s really expensive. I love how sturdy the mirror is and the sleek and simple design is aesthetically pleasing. The standard size mirror is designed for you to be able to see your entire face. After testing this, I felt that I could indeed see the entire face, but only when I was up close to the mirror within 4-6 inches of the surface. Seeing my entire face up close in that much detail was a little too uncomfortable, but this mirror has made a world of difference when it comes to eyes and lips. It’s great for tweezing brows and applying eye makeup. Applying eye liner and eye shadow is so much easier now that I can really see what I’m doing. Also applying mascara and curling lashes is easier now that I can see where to place the wands/tools better. It’s good for getting a precise lip as well. For face makeup this works, but I tend to step back and see how my blush and bronzer are applied from a distance to make sure it’s subtle and blended well.The sensor is good at sensing movement. However I found it turned off too quickly if I moved my head away to pick up something. I didn’t find it too troublesome to be an annoyance, but having an extended timer for a shut-off delay is an option I would have liked. Cleaning cloth and charging tools, plug in area is at the base of the stand, I love the design so it’s really subtle and blends in well with the base. It’s great that this doesn’t require cords for use so there’s no messy look to it and your counter or desktop will remain clutter-free. One charge is supposed to last up to 5 weeks, but I haven’t had this long enough to see if it really does last that long. I’ve been using this for a week and now I don’t ever want to be without one. My brother already asked if he could have it if I ended up hating it. For me I love it. There’s no more squinting or straining eyes to see exactly where I’m putting my eye makeup on. I can apply mascara so much better now and see where to apply it precisely to my lashes. The $200 price tag is extremely steep for a mirror but it’s a quality product that is well designed and extremely well made. There’s nothing I’ve seen or tried that comes close to the design and quality. The lighting is bright and white so it doesn’t distort color like some lights can. If you’ve tried simplehuman products you know that everything is extremely well made. I am a huge fan of all the products I’ve tried from the line. On pricing, for reference, the older Restoration Hardware mirror I have was around the $100 price range when I bought it several years ago – it was the only sturdy metal mirror I could find with a simple no-fuss sleek design. It has a regular mirror on one side and a magnified side on the other with a brushed nickel stand. For the simplehuman Sensor Mirror, I would probably be more willing to buy it at full retail price without hesitation if it were around the $150 range. At the $200 price, it’s a bit steep, I probably would have shopped around to see if I could find a way to save on the price or wait until there were double/triple points event. Still, the mirror is built with a sturdy base and is well constructed with unique details I would have never thought of. The simplehuman Sensor Mirror retails for $200. Available at Nordstrom, Neiman Marcus, simplehuman and other retailers. 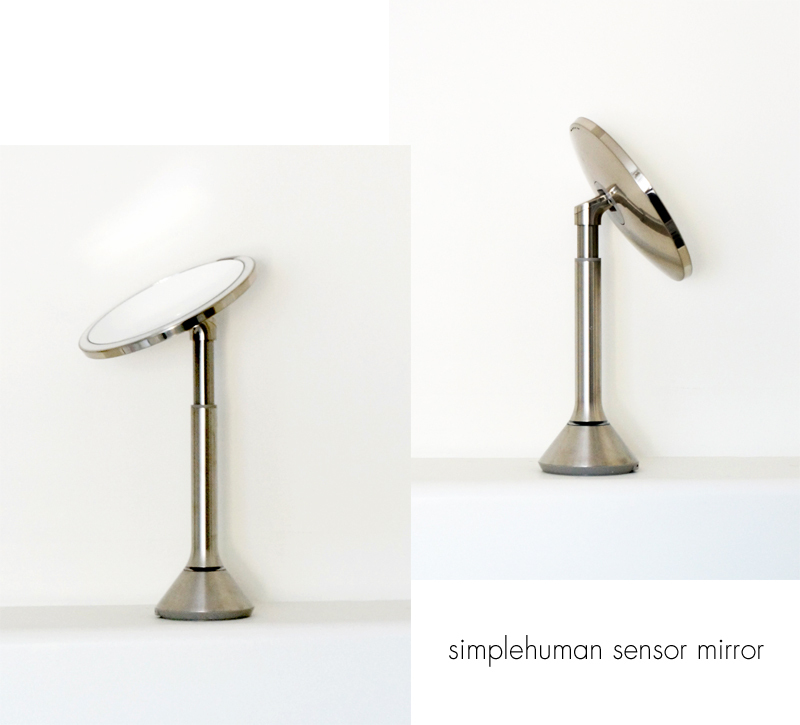 The simplehuman Sensor Mirror was provided for review consideration. All opinions are my own. I’m launching a series of my favorites and essentials. I’ve been asked by many of you to share what are my holy grails for hand/nail care, tools, foundations and skincare. My favorites change as I discover new products, brands and tips so for this series, so I’m taking extra care to pick out my tried and true. First set includes what my essential eye makeup brushes are. I built my brush collection bit by bit over many years. My first brushes (MAC, Stila and Trish McEvoy) were purchased during my college years and with careful storage and care, most have lasted quite well since then. Over the years, I’ve added more one by one. I prefer to purchase brushes individually because I usually find the quality to be much better than brush sets from the same brands. I’ve compiled a list of my top picks for eye brushes. When it comes to eye makeup, I’m usually a minimalist and I like to blend a lot. There are literally hundreds of options out there. If you are new to eye makeup or feel like you’re a novice with application, I’d recommend attending one of your local events at your Nordstrom or Bloomingdales. I’ve learned so much from artists, in particular NARS, Chanel and Le Metier de Beaute. Many of the artists have worked with multiple brands are are free-lance artists. They can help show you different techniques and often can help compare a few different brushes from mainstream brands. If you’re just starting out or have a smaller budget for tools, I’ll share my top 3 picks to get started below. Long handled brushes are easier for me to pick up so I prefer brands that have longer handles (rather than all short). I also look for a brush that will not shed or fall apart after washing. I usually won’t pay more than $50ish for an eyeshadow brush, although I have made the exception for Tom Ford. I prefer brands I can access in person since for me it’s very important to try the brush in person before buying. The brand with the best brush selection and price is MAC, although they don’t have every kind of shape or material (if they did, all my brushes would probably be from them). Edward Bess Luxury Eye Brush ($40) is hands down the best fluffy all over eye shadow brush. There are dozens of other brushes with a similar shape, but most are not dense enough (the less dense the sheerer the application of color is). The Edward Bess brush is well designed and has enough bristles packed in to really pick up and layer color. Chanel Brush Large Eye Shadow Brush #25 ($38) is my favorite large/flat eyeshadow brush for a sheerer all over application. It’s a good brush to give your lids a wash of color and applies it evenly. Trish McEvoy Medium Laydown #40 ($43) is a good brush for cream shadows or blending bases all over the lid. I like that it’s a bit thicker than most cream shadow brushes which makes the blending process easier for me. MAC #217 ($24) is one of the best multi-purpose brushes. You can use this to apply shadow all over the lids, blend colors together or use this for your crease area. It’s super soft but still well packed to pick up color. MAC #239 ($25) is another staple. I wish MAC made more brushes this size with different materials because this is the perfect shape for your basic eye shadow application. It’s soft and dense and blends well. It picks up more color than the #217, but I usually use both together. MAC #226 (discontinued) has been released and re-released a couple times. It’s now discontinued, but it makes the perfect detail brush and for those with creases, is the ultimate crease brush. 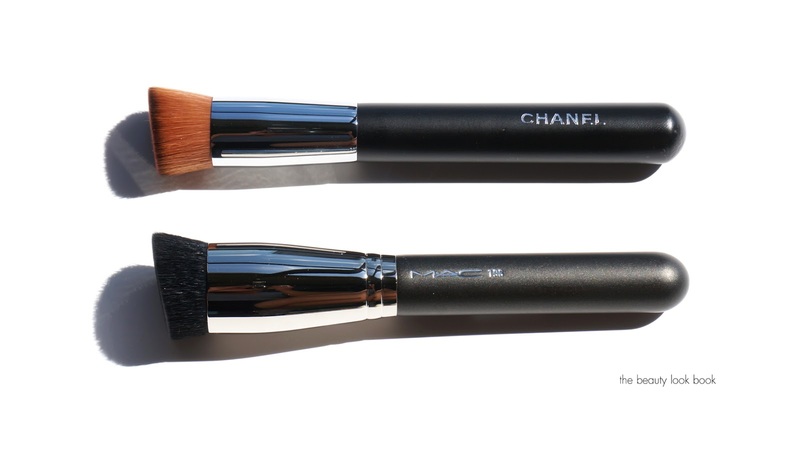 Chanel Large Tapered Blending Brush #19 ($38) is the closest I’ve found to MAC #226. It’s a bit shorter and more domed-shaped though. This one is good for a smokey eye or blending darker shades. Tom Ford Eye Contour #12 ($55) is one of my favorite multi purpose brushes. It never fails me. You can read more about it in my review here. MAC #219 ($25) is another great detail brush for smokey colors or to highlight inner corners. It’s pointy at the end for good detail but soft enough for those with sensitive eyes. Laura Mercier Smudge Brush ($24) is my favorite smudge brush. There are a number of smudge brushes from other brands but this one picks up color the best out of any I’ve tried. Bobbi Brown Angle ($30) this one was from a set but is the same quality as the individual ones. For liner or brows I usually prefer brushes like the smudge brushes, but this one is great for a thin liner with shadows or creams. Tom Ford Definer #15 ($50) is another smudge-like brush. The end is really thin but dense which makes for a good cream or gel liner application. I have a weak spot for white haired brushes because they are generally softer than others. Bobbi Brown Gel Liner ($27) is my favorite gel liner brush, it’s a classic. If I could only pick five brushes for the most basic level, my top picks would be the Edward Bess Luxury Eye Brush, MAC #217, MAC #239, Tom Ford Eye Contour #12 and the Laura Mercier Smudge Brush. I hope this helps you find some new favorites!